New Delhi: An unexpected spurt in refunds could dent the net collection of income tax paid by companies in their third and penultimate instalment for 2009-10 that is due on Tuesday. However, if gross advance tax payments do match the optimistic expectations of the finance ministry, it would be yet another confirmation of the fact that the economy is steadily stabilizing. Advance tax payments are made by companies based on their internal estimate of the year’s profit. Tax refunds in 2009-10 (until week ended 12 December) were around Rs37,000 crore, higher by 46% than those for the corresponding period of 2008-09. In the preceding two full fiscal years, refunds grew by 3.04% and 1.17%, respectively. 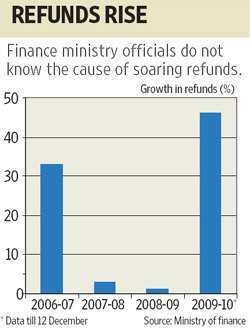 The last time there was a double-digit growth in refunds was in 2006-07, when they grew by 33% to Rs39,754 crore. The worrisome aspect of the growth in refunds for the government this fiscal is that finance ministry officials do not know the cause. Consequently, they have no way of estimating what the final outgo could be. Among the different reasons attributed by finance ministry officials for the sharp growth in refunds in 2009-10 are: guidelines to income-tax offices to preferably issue refunds within four months of tax returns being filed; and streamlined internal processes within the tax department that have accelerated the pace of work. Sudhir Kapadia, partner at Ernst and Young, had a different take based on his experience: “It (refund growth) is a reflection of higher demand being raised, many of them unsustainable. A large portion of it gets overturned in appeals." When the current fiscal’s tax collections are placed in a larger context, the signs are good despite the spike in refunds, finance ministry officials said. According to a finance ministry official who did not want to be named, direct tax collections this year have been good. Till the week ended 12 December, gross direct tax collections were Rs2.3 trillion, about 8% higher than the previous year. After deducting refunds, the net collections were about Rs1.93 trillion, higher by only 3.2%. On the face of it, the growth in net direct tax collections so far has been lower than the 8.82% growth to Rs3.70 trillion announced in the budget estimates for 2009-10 over the previous year’s actual collection. Finance ministry officials, however, are upbeat as the year-on-year growth masks the odd pattern of tax collections in 2008-09. In 2008-09, direct tax collections in the second half declined, following the external shock the economy received after the collapse of Lehman Brothers in the US in September 2008. Consequently, in 2008-09, tax collection ran counter to the normal seasonal pattern when the second half of the year sees 60-70% of aggregate net direct tax inflows. In 2008-09, only 50% of the annual collections came in the second half of the year. “Our base for comparison is 2007-08," the same finance ministry official said. If the normal seasonal pattern is repeated, the gross direct tax collection in the rest of the year should grow by at least 20%, the official added, as a statistical base effect will also come into play when calculating annual growth. Still, the growth in refunds could play spoiler.